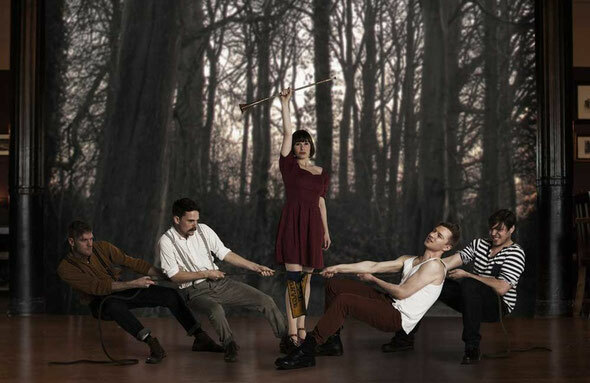 On 11th June Skinny Lister unveil their 13-track debut album entitled ‘Forge & Flagon’ on Sunday Best Recordings. Harnessing the energy and fervour of the band’s live performances on every track, the album was recorded in deepest darkest Snowdonia, with producer David Wrench (Bat for Lashes, James Yorkston). The album is punctuated with Skinny’s trademark shanties which go to make every Skinny Lister gig so inclusive. ‘Forge & Flagon’ features legendary folk players including award winning Northumbrian piper Kathryn Tickell and fiddle player extraordinaire Roger Wilson. The band are not your average, modern day, gentrified English folk group. Fronted by Dan Heptinstall and Lorna Thomas, the London based five-piece hail from across England. Borrowing the nickname from the Lister family, pioneers in the use of anesthetic, the band have grown naturally and organically over the past two years. Yorkshire born songwriter Heptinstall, Lorna’s older brother Max, and long-time shanty singer Sam ‘Mule’ Brace, met some time ago at a folk club in London’s Greenwich area. The arrival of Tyneside bassist Dan Gray and Lorna completed the group.